I went back and forth for a few days trying to decide whether or not to share this recipe today. I mean, it's roasted grapes—that's it. Simple to make, no big frills, no huge backstory. Just roasted grapes. For all I know, I was the last person on the face of the earth to actually make (or try) them. I've seen them floating around in one form or another for a number of years now. I've been meaning to make a batch. I finally did. They're everything I thought they would be. I didn't roast them alongside a chicken or a pork roast. I didn't press them into any focaccia dough. I didn't toss them with some perfectly cooked tender grains. They're just grapes, but they're totally worth sharing. Because maybe I wasn't the last person in the world to try them. It's usually the simple pleasures that delight me the most. I'm constantly amazed by the product of time and temperature. Slowly simmering fruit and a bit of spice can yield a jar of rich, silky fruit butter (like this Cardamom Pear Butter). Roasting broccoli and cauliflower takes both of those humble veggies to a whole different level. Pureed fruit and a low, slow heat produces chewy and sweet fruit leather. Duck legs wiling the day away in a bath produce meat so meltingly tender it just falls into your fingers at the lightest touch (like these Asian-inspired Braised Duck Legs). Nothing more than time, steady heat, and its own rendered fat can turn pork into the most flavorful Carnitas you'll ever taste. It's kind of amazing. 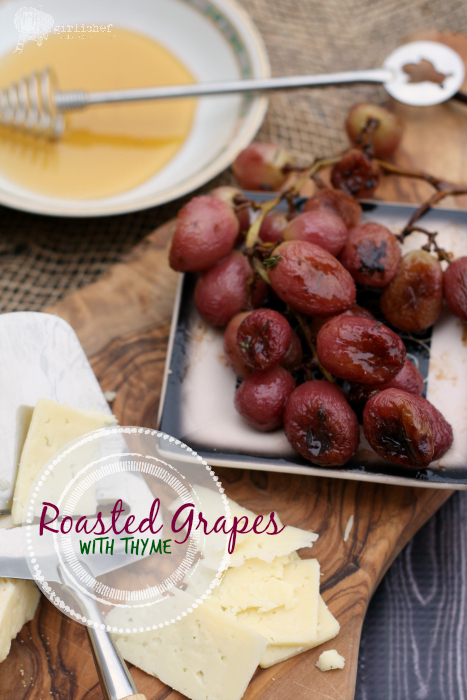 The same magical transformation happens to grapes when you roast them in a hot oven. Crisp and sweet turns to deep and rich. The sugars concentrate in the heat, and a burst of flavor that must taste like late-August sunshine explodes onto your tongue. So is the recipe, simple as it may be, worth sharing? You bet it is. Roasting grapes brings out their natural sweetness; a drizzle of olive oil adds richness, while a hint of fresh thyme lingers in the background. Try adding them to your next cheese plate! Set the grapes on a rimmed baking sheet (on or off the stem, it's up to you). Scatter the thyme sprigs around, then drizzle with the olive oil and sprinkle with the salt and pepper. Toss everything around a bit, making sure everything is coated with oil. 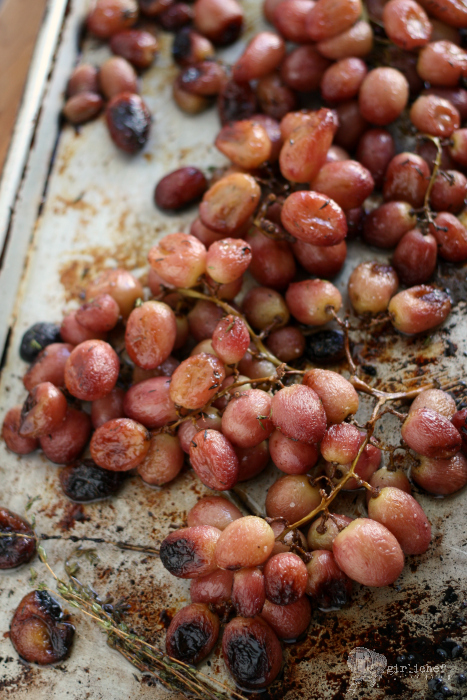 Slide into preheated oven and roast until the grapes have caramelized in spots and started to burst, 30 minutes or so, shaking the pan once or twice during roasting. Let cool slightly before serving. 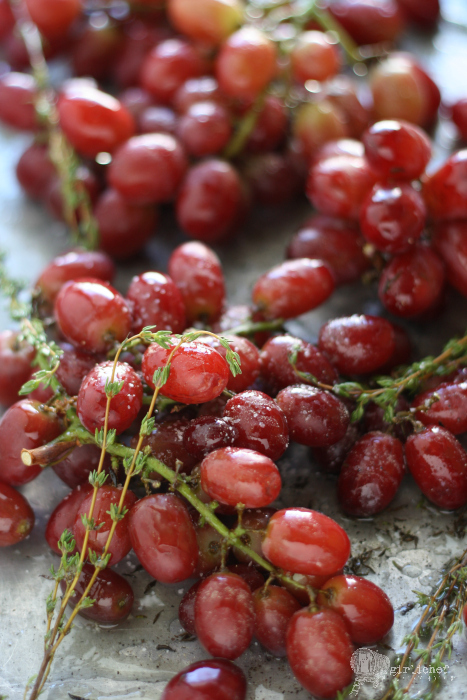 Refrigerate any leftover grapes in an airtight container once completely cool for 2-3 days.